Films about dysfunctional families reconciling with each other while reaching an objective should leave you with a warm feeling in your stomach, but Kodachrome instead opts to be both sickly sweet and nauseatingly stale. The film manages to hit an emotional high in its penultimate moment, but it’s a frustratingly flat ride to get there. The title Kodachrome refers to a type of photography whose processing labs are being shut down in America, and elderly cancer-ridden Benjamin (Ed Harris) tries to enlist the help of his estranged son Matt (Jason Sudeikis) to drive him to Kansas to develop his last remaining kodachrome film. 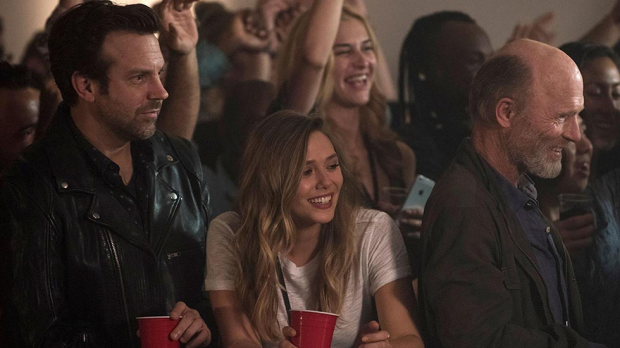 Matt seems adamant about not helping his father out with his last dying wish, but is egged on by Benjamin’s personal nurse Zooey (Elizabeth Olsen), and is also enticed by a job-saving opportunity en route that may keep him from being fired at his band management job. So the three of them jump in an old red convertible and take a ride through one telegraphed plot-point to the next. Whenever the film isn’t unsatisfyingly predictable, it’s forcing irony in its story in an equally unsatisfying way. Kodachrome gets moving to a rocky, bumpy start, showing its characters walking in and out of offices explaining the plot to each other, espousing as much character development as a bowl or porridge cooling on a windowsill. The apparently individualistic, apparently coarse former hot-shot that is Benjamin is at least supposed to be the only non-bland lead character that will spice up the film, but even he has very little to contribute to this insipid road trip. Harris teases the brash offensiveness and sparkling unconventionality he could bring to this anti-hero of a dad, but the badness in his character is never really explored. He appears like a slightly eccentric, slightly unorthodox nostalgic old man, and the reason his son feels so hostile towards him is left ambiguous, ergo again unsatisfying. It doesn’t really fill in the blanks of these already hollow characters. The main focus of the film should be between Matt and his dad, but given this is a grossly derivative drama, it mostly detours away from that to the burgeoning relationship between Matt and Zooey. Since they are both so equally bland, they seem perfect for each other. Kodachrome is a safe film with nothing offensive to say, but its intense mediocrity is its highest insult. It has the cinematic flair of a cable TV-movie and the narrative complexity of a children’s book written by a pop singer. It hits so many of the familiar beats that there’s just about zero room for any originality. No matter what kind of dad you have, journeying across the country with him would be more enjoyable than watching this road movie whose trip goes from point A to point A.